DOMLEC, Dominica's only electricity generation and distribution Company is so passionate about safety that the company's public relations officer began a press conference to offer two scholarships with this safety advice: she pointed to the emergency exit door and she reminded reporters that in case they have to use that door, gather in the courtyard. Then the conference to present two scholarships for the 2018 scholarships year began. The DOMLEC scholarship students are Asafa Powell, who was out of state during the presentation ceremony will be attending the St. Mary's Academy (SMA); the other was Gabriela Magloire who will attend the St. Arthur Waldron Seventh Day Adventist Academy in Portsmouth. "This year for the academic year 2018/2019, we will have 19 scholarship recipients in school. 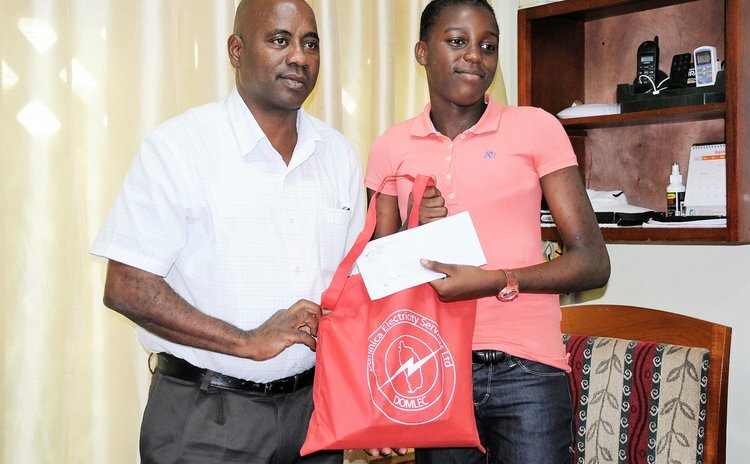 Five of our students graduated at the end of the last academic year, so for this year we will have 19 scholarship recipients in a total of seven schools around the island and for the first time this year we will have Gabriella attending the St. Arthur Waldron Seventh Day Adventist Academy, so that is a new addition to our list of schools," said Ronald Isidore, the company's Human Resources and Administration Manager. "One of the things that we also try to do is to support the students in whatever needs that they may have from time-to-time and that includes academic support. "We also make the company's resources and staff available to provide health and wellness support to the students. "If it is noticed that a student is having difficulty in a particular subject area we facilitate that extra help for the child. Isidore told the student and parents: "You are now a part of the DOMLEC family, so the expectation is that great things will happen based on the partnership that we have with the parents and the students during the academic year," Isidore said. In 2017 before Hurricane Maria devastated Dominica and caused $9.35 million in losses to DOMLEC's balance sheet, the company issued four scholarships. Now it can afford only two. DOMLEC's scholarship programme began 39 years ago; each year the company provides to its scholarship winners the cost of textbooks, stationery, transportation and payments of CXC examination fees for five years depending on the student's performance. In 2017 DOMLEC said it spent approximately $35,000 annually on its scholarship programme.